Drop everything and start hitting the Like button on Instagram, because Han Solo movie director Ron Howard just posted a new shot from the the set of the upcoming Star Wars spin-off. The caption reads "The Empire looms large" and the subject matter will be instantly recognizable to fans as one of the helmets worn by Death Star troopers. Business in the front, swooping black party in the back. It's resting on what looks a lot like a Death Star control board too. A Death Star trooper (and his helmet) in action. Begin wild speculation about what this means for the plot now. 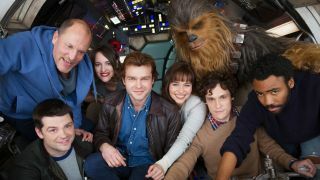 We don't know much about the new Han Solo movie - it doesn't even have an official title yet - but we know it'll be a prequel, following a young Han Solo before the events of the original Star Wars movie. That means the Death Star would still technically be a secret project under construction. It could build on the foundations set up by Rogue One, where we learned more about the origins of the Death Star through the story of Jyn Erso's scientist dad. Howard seems to enjoy teasing fans with snaps straight from the movie set, so keep your eyes locked on his social media accounts for more behind-the-scenes action. The Han Solo movie is currently scheduled to be released on May 25, 2018.